Facebook advertising is one of the most important tools in a marketer’s arsenal. With over 1 billion people visiting Facebook every day, targeted Facebook ads can help small businesses reach a substantial audience at a fraction of traditional advertising costs. 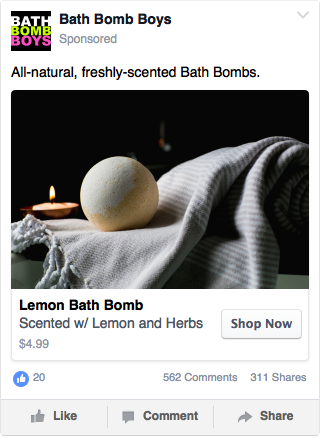 Despite the potential reach, a lot of merchants stay away from Facebook ads due to their complexity. From targeting the right customers to designing effective ads to evaluating the success of the campaign - the social network Mark Zuckerberg created in his dorm-room makes it easier for businesses of all size to grow. Even though many social networks have popped up over the years, Facebook remains the top choice for marketers everywhere. Inbound marketers have discovered massive opportunities with Facebook. Opportunities that make it unique from the Snapchat’s, Twitter’s and Pinterest’s of the world. With so many benefits, it’s easy to see why marketers have Facebook ad budgets of up to $250,000 per month. One of Facebook’s key strengths is its numbers. 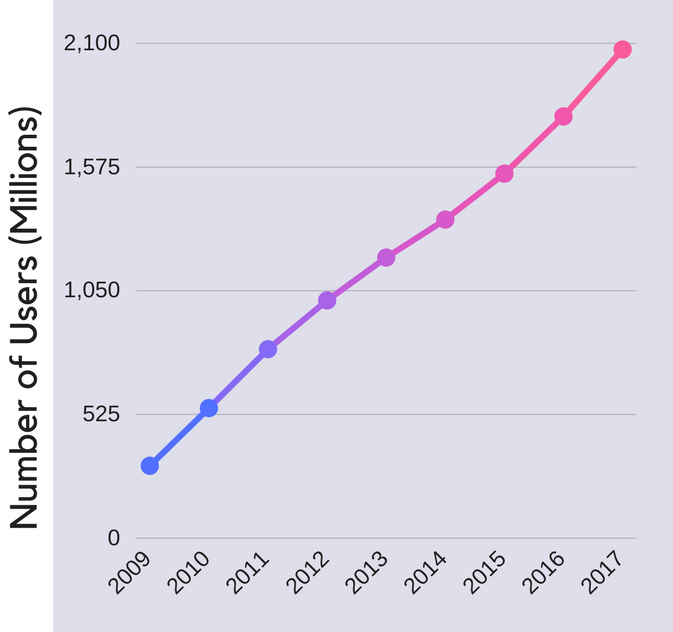 Currently, 1.393 billion people use Facebook and 70% of them log-in daily. For any business, a population of potential customers that big is enticing. But it’s not just quantity, it’s quality too. The fact that users create and share content that provides information into their behavior, purchasing habits, and interests, makes it perfect for zeroing in on your target demographics with Facebook’s Ad Targeting. 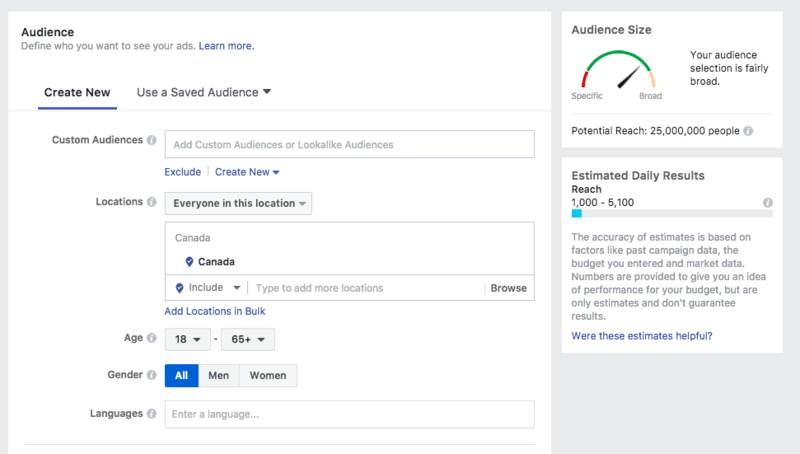 With Facebook’s ad targeting options, you can target users based on age, gender, relationship status, education, workplace, job title and more. Your ad audience can even be geographically segmented with radius maps - allowing you to show your ads to people in specific locations. Facebook also features interest targeting, which makes it easier to pinpoint niche audiences for your ads. Everything, from hobbies to sports teams, has a Facebook fan page for users to follow. These fan pages act as engaged and lively communities that also provide insights for complementary brands to reach page followers. Facebook fan pages are a great way to gage which users are more likely to show interest in a business. But Facebook’s targeting options don’t stop there. Facebook allows advertisers to reach an audience based on their browsing and spending habits. With such rich insights on a user’s browsing and spending behavior, your Facebook ads can be targeted to users that purchase complementary (or even competing) products, use specific devices, and even spend a certain amount of money online. Facebook even has a lookalike audience feature that allows you to target users with interests and buying habits similar to users that follow or have purchased from you previously. Organic reach: number of unique users that were shown your post through unpaid distribution. This includes any users who see your post because one of their friends shared it in their feed. Paid reach: traction your post receives via paid methods, through boosting or running an ad. Current News Feed algorithm, which prioritizes content similar to what the user has engaged with. While this means more meaningful and relevant content is being delivered, it also limits the reach of individual pieces of content. There are still a few ways to increase the organic reach of your content. For example, since the algorithm rewards content that has more engagement - encouraging users to like, share or comment on a post is one way to increase organic reach. However, given the limitations of this content, it’s still a good idea to get into paid ads. On Facebook, ad costs are on a sliding scale, so nearly any business can afford to advertise. When you set up an ad campaign, you’ll let Facebook know how much you want to spend on the campaign. And Facebook will expose as many users to the ad that the amount allows them to. You can choose to spend as little as $10 a week or as much as $10,000. Facebook’s sliding scale allows a business to adjust their amount so it’s within budget. The budget is only a control tool: you’re not actually paying for ads when you set your budget. Your budget is a way of telling Facebook the maximum amount you’re willing to spend on an ad, which is distinct from the actual amount spent on the ad. The actual ad spend is determined by ad auctions. 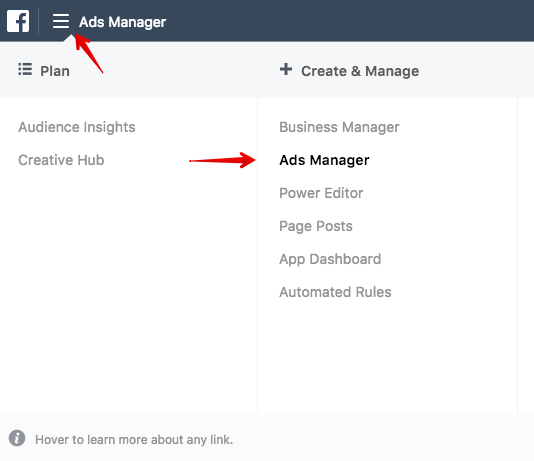 When you open up Facebook ad manager, you’ll see a plethora of ad types the social network has to offer. 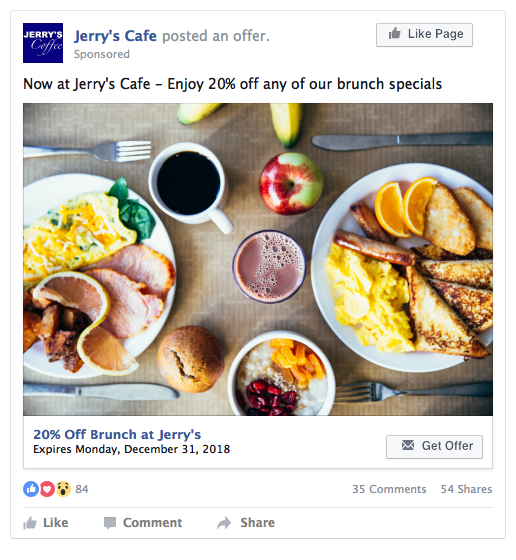 Each Facebook ad type has its own unique benefits, specs and use cases. Single image ads offer businesses a simple way to get users on their website. Setting these ads up is easy and they’re effective in increasing your store’s traffic. Successful image ads use catchy headlines, dynamic images and a clear call to action. Although the Facebook image ad size is 400 pixels wide by 150 pixels tall (at minimum), it’s recommended your image size for this ad type be 1200 pixels wide by 450 pixels tall. This is consistent with Facebook’s display ratio and ensures an optimal viewing experience. Ads on Facebook with a lot of text are subject to a review process that prioritizes them lower than ads without text. It’s recommended text occupy 20% or less of your image. If you think your ad contains too much, you can use Facebook’s text review tool. Technically, there is no limit on post text, however, Facebook truncates it at 125 characters. 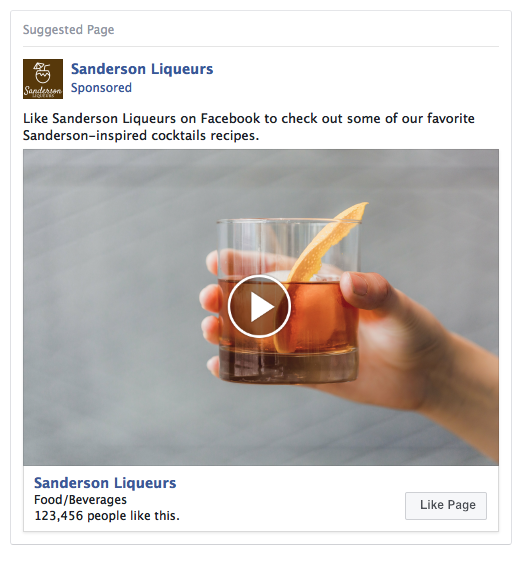 Facebook’s video ads allow you to create videos that appear in your targeted users’ feeds. Videos drive greater engagement than images, so these ads are more likely to be seen than ads with still images, although they require more preparation. 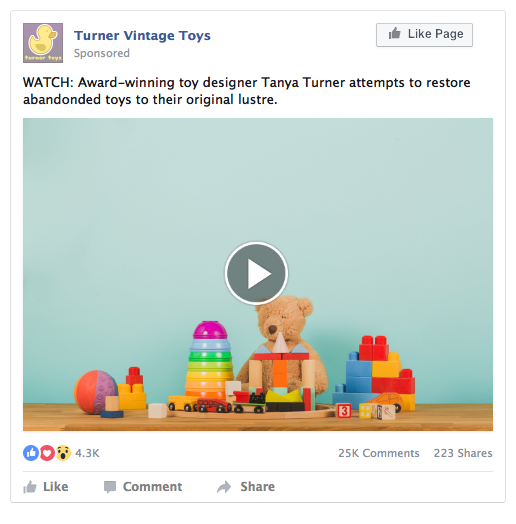 Video ads on Facebook recieve about 10-30% more views than image-based advertisements. With the high-engagement rate, an eye-catching video ad is a great tool for building brand awareness and snapping up the attention of the user as they scroll through their feed. In addition to having a stunning visual, you can also add sound and captions to your Facebook video ads. Technically, captions are optional but we recommend including them as 85% of Facebook videos are watched with the sound off. Since so few video ads are watched with sound, consider using a GIF or cinemagraph, which Facebook allows you to use instead of a video. 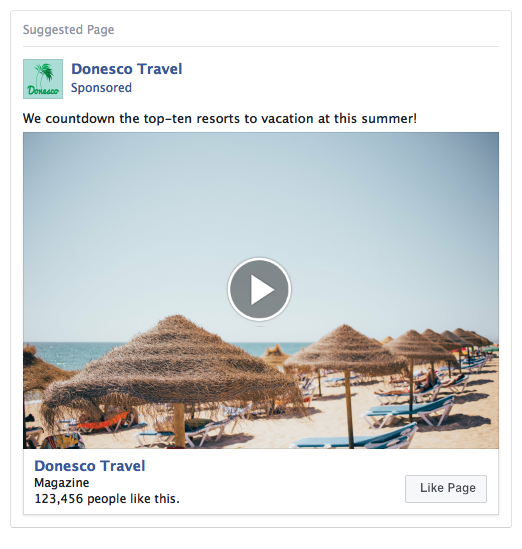 Facebook Carousel ads allow you to showcase up to 10 images or videos within a single ad. Each image included in the ad includes its own link to direct users to a specific page. With the greater visual real estate, Facebook Carousel ads allow you to get more creative.ad. With each image having its own call-to-action, showcasing a collection of products, features of a single product, or telling your brand story are that much more engaging. 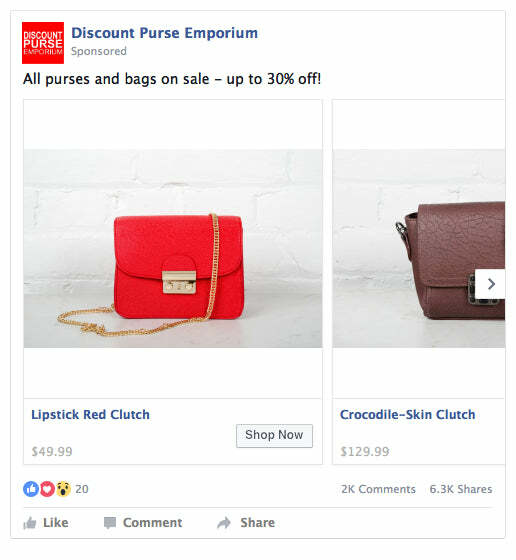 Facebook’s offer ads allow you to share discounts with your customers. Offer ads are effective for quick conversions and can be used to advertise sales and promotions for retailers. When your offer shows up in a user’s feed, they can redeem it instantly or or save it for later. 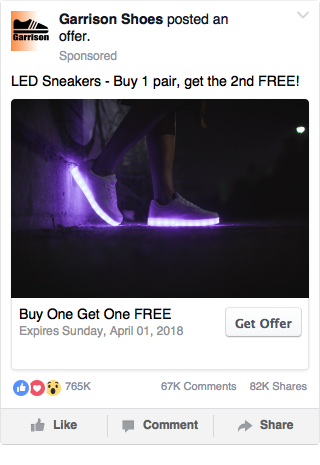 Users who save the offer will have it appear in their offers section on Facebook and they’ll be reminded of the offer up to 3 times - depending on their notifications. Facebook offers are a great way to acquire new customers by offering an exclusive discount. Even if users don’t immediately convert into customers, brand awareness is still being built. 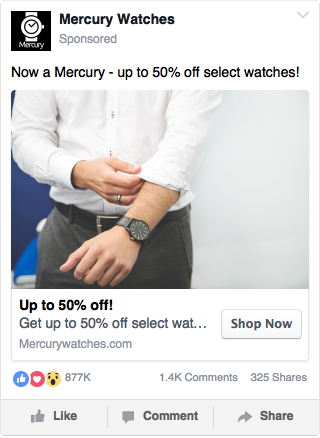 For your Facebook offer, you want to make sure that the discount is substantial and enticing enough for someone who hasn’t heard of your brand. 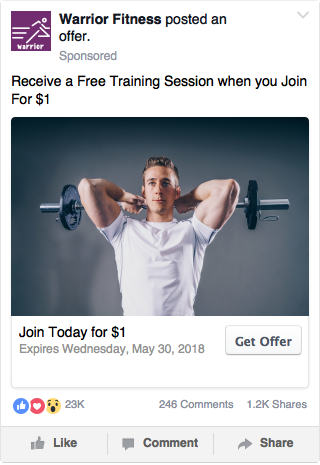 Although there’s no minimum, Facebook recommends a discount of at least 20% or offering free trials for greater effectiveness. Images of the product in-use also tend to be more effective than images of just the product or a logo. Finally, pinning the offer to the top of your Facebook page increases exposure and likelihood of engagement. 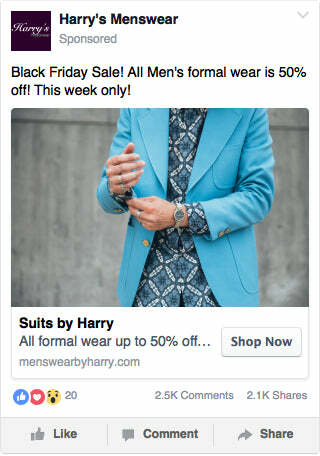 Facebook Canvas ads are a new format that released last year. Canvas ads are unique as they’re designed specifically to be viewed on mobile. The canvas experience is triggered from the user's phone by clicking the ad as it shows in their news feed. Canvas ads are useful for business owners looking to create an immersive experience. Canvas ads contain videos, images, and carousels for users to interact with. There’s even a tilt-to-pan feature that makes content immersive. Additionally, you can tag products so users can follow links to purchase those products. Facebook requires the same specs for images and videos in canvas ads as other ad types. However, since canvas ads are mobile-only, you’ll need to optimize them for smartphone devices. Although a full-screen image will have a width of 1080 pixels and a height of 1920 pixels, you can make the image much wider for the tilt-to-pan feature. Facebook recommends portrait orientation for the videos since this is intuitively the position the viewer is likely to have their phone in. You can have as many videos in your canvas ad as you want, but it’s not recommended that the collective run-time is more than two minutes. Lengthy videos can result in long load times, which can reduce a user’s engagement. Additionally, the average user only engages with a canvas ad for thirty seconds, so longer videos lead to less complete views. Longer, more informative videos tend to work better as Facebook posts. 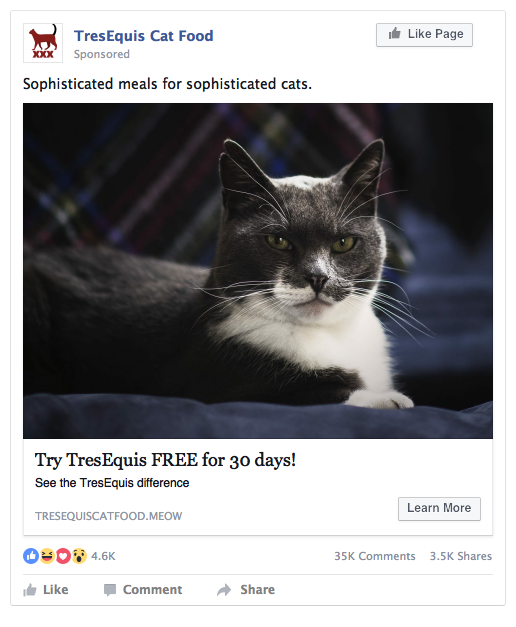 Although dynamic Facebook ads look like any other ad out there, their setup and function is unique. Rather than creating an ad for individual products, you’ll be creating a template that auto-fills the ad with information about your products or services pulled from a data feed. Dynamic ads are specifically targeted to users who’ve shown an interest in your products. Facebook is able to pull information from your Facebook pixel and SDK to show ads to people who’ve expressed interest in your product by taking action such as clicking an ad or viewing a product on your site and adding it to their cart. The process is mostly automated, since creating a single template feeds the right products to the right users. This means that the biggest benefit to dynamic ads is that merchants tend to get more conversions at a lower cost-per-click. Once your product catalog is uploaded, dynamic Facebook ads will be created and populated from the provided data source. You’ll be given the option to show all of your products or ones that your customers viewed, added to their carts or purchased. Dynamic ads can be displayed as either carousel ads or single image ads. A single template will deliver ads on both desktop and mobile platforms. The most important thing about dynamic ads is to target the right audience. Facebook allows you to target users who haven’t purchased yet, but have shown an interest. You can exclude users who’ve purchased from you recently to avoid paying for ads to users that are less likely to buy. You’ll also be asked to set a retention window - which Facebook recommends placing at 30 to 90 days in order to increase the exposure of your ad. Facebook Lead ads are used by businesses to collect contact info from potential customers. With lead ads, users provide their information (such as name, phone number, or email) and sign up for more info or request to download a resource. Although Facebook Lead ads will display images at 400 pixels wide by 150 pixels tall, they should be sized at 1200 x 450. Depending on the ad’s purpose, your call to action can direct to a landing page or a pop-up window with their pre-filled name and email. Once a user hits submit, their email will be sent to your lead list which can be downloaded from Facebook. You can also use a service like Zapier so leads are automatically transferred to your email marketing software. Lead ads are a great tool to grow your email subscriber list. It also allows businesses to create buzz around an upcoming product. Service-based businesses can also use them to build their customer list through a free trial offer. 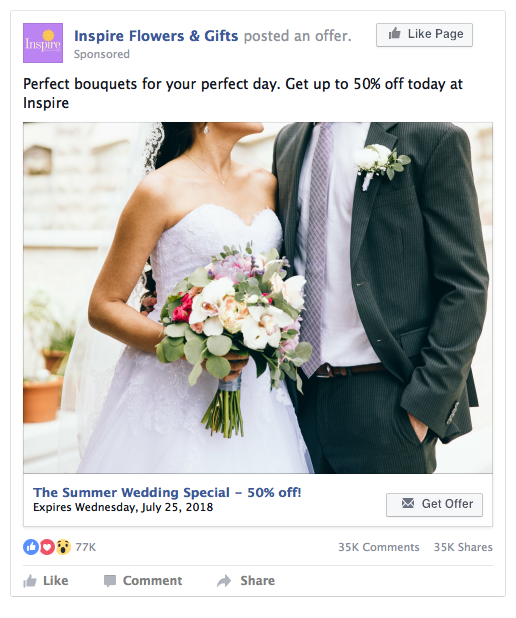 Facebook Collection ads are a visually immersive format that allows merchants to create a single ad that showcases a collection of products or services. With this ad format, users can browse and purchase through a variety of products. 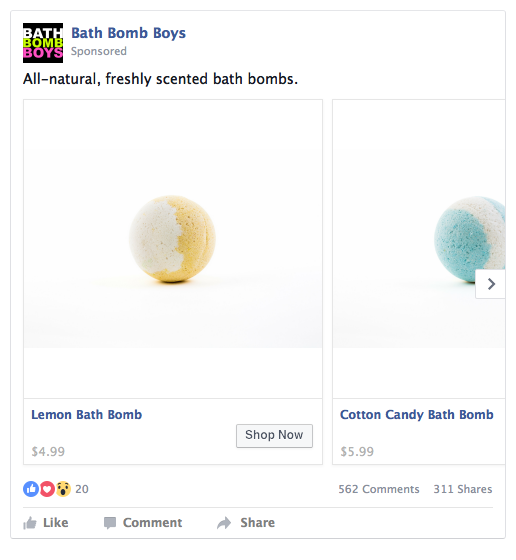 Collection ads involve a picture or video followed by thumbnail product images. When someone clicks on a collection ad - they’ll land on your canvas ad. Like Canvas ads, Collection ads are designed for mobile. The idea behind collection ads is to create an in-store-like shopping experience. Users are shown the ad in their mobile news feed with four products initially, and tapping on the ad will show a collection of up to 50 products from your catalog that are automatically selected by Facebook based on the user’s preferences and the merchant’s user-targeting settings. Collection ads will typically display a main image or video and several product images. If you choose to include a main video, you’ll want the video to have an aspect ratio of either 16:9 or 1:1. For the images - you want to use a ratio of 1.9:1 sized at 1200px x 628px. 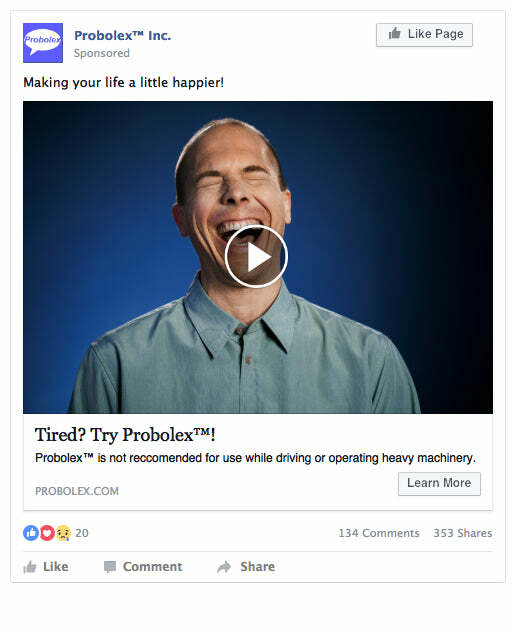 Facebook Page Like ads are unique from other formats as they focus on engagement, rather than conversions. With this ad format, you can build brand awareness by creating posts that engage users and share stories about your business. Analyzing your own page like ads helps you understand the content that’s most likely to drive user engagement. The aim of a Facebook page like campaign is to attract users that are likely to be interested in your brand and posts, so you can grow your following. Users are less likely to like, share or comment on something that seems like an ad. This means that dynamic and interesting content is more valuable than content that’s focused on selling. When trying to determine whether the ad should contain an image or video, allow your content to dictate the selected format. Even though videos have higher engagement, a colorful and visually appealing image can be more compelling than a mundane video. 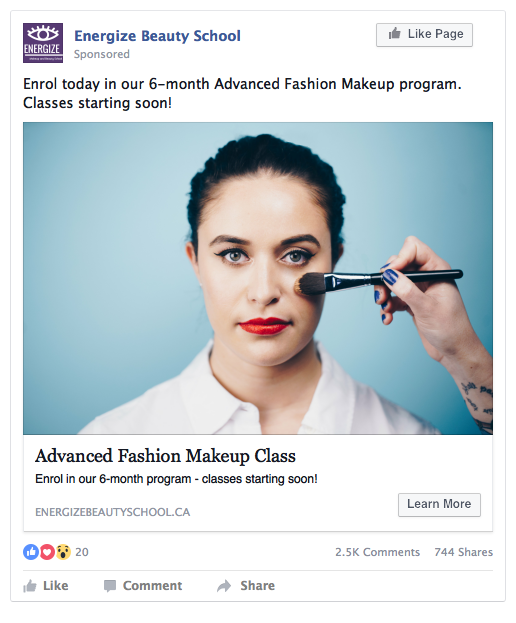 Now that we've gone over the different types of Facebook ads, let's explore setting up a Facebook ad campaign. When setting up your Facebook ad campaign, the first thing to consider is the goal. For example, if your brand is new to Facebook, you could have a goal of obtaining Facebook likes from a campaign. If your business is more established, you’ll want to focus on conversions. Your goal can change depending on the stage of your business. Facebook offers a number of advertising objectives for you to choose from. To understand which ad objective is best for your business - it’s important to understand the marketing funnel (also called the purchase funnel). The marketing funnel is a model that represents the customer journey - from awareness to conversion. 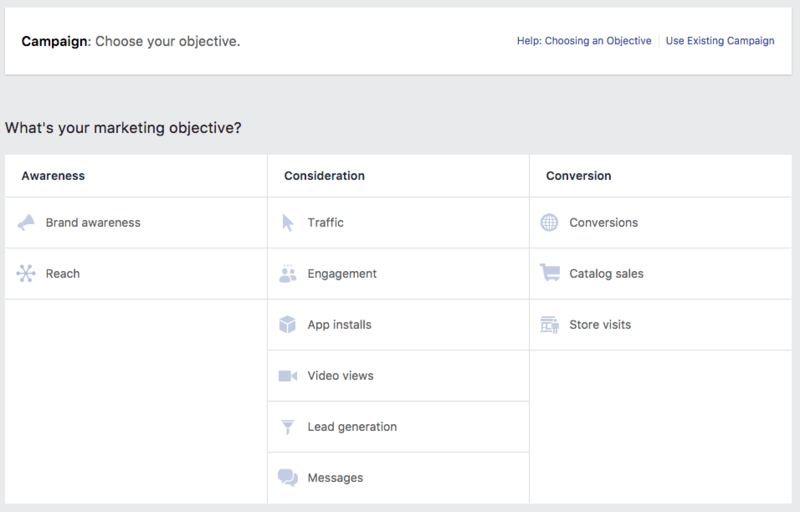 Facebook ads sort their ad objectives into three steps in the marketing funnel: awareness, consideration, and conversion. Awareness campaigns are perfect for newer businesses. If your Facebook page has less than 1000 likes, you’ll want to consider running an awareness campaign. The goal of an awareness campaign is to establish a relationship with your followers. Page like ads are the best kind for an awareness campaign. 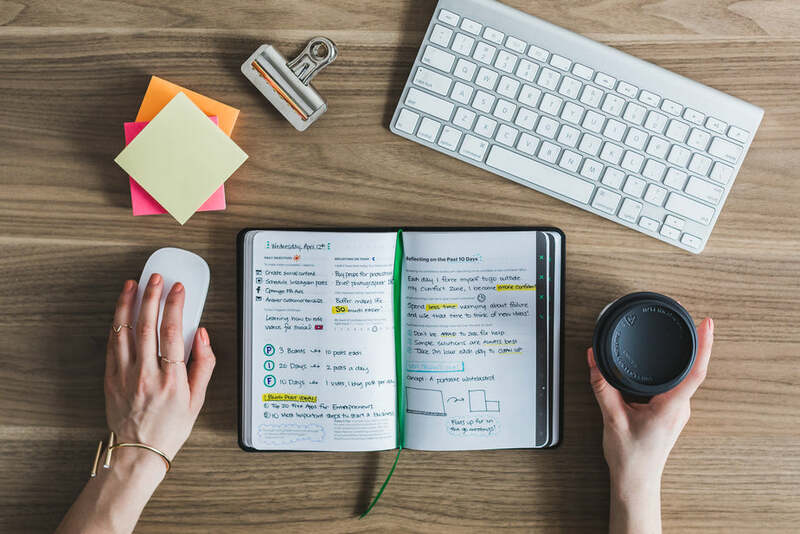 Since you’re reaching for page-likes, these ads are perfect for introducing users to your brand and provide clear, measurable metrics for success reporting. With awareness campaigns, you want to avoid directly selling to users. For now, you want to demonstrate to your followers the value of following you on social media. To do this - focus your energy on creating interesting and relevant content. Awareness campaigns are all about proving to your customer that you’re worth following. If you already have an established Facebook following, consideration campaigns allow you to build a deeper relationship with your audience. In consideration campaigns, you’ll be targeting users with tailored, product-specific content. To target the most relevant users possible, it’s recommended a consideration campaign follow previously run awareness campaigns. This will ensure that Facebook has enough user-data to be able to implement user-specific ad strategies. Lead ads are the best ad type to use for consideration campaigns. If you’re running a lead campaign, consider offering a free product or service (such as webinars, workshops, ebooks, etc.) in exchange for an email address. As with an awareness campaign, avoid soliciting your followers too aggressively. Offer discounts at this stage and make users aware that you’re selling, but keep your focus primarily on quality content. This is a stage in the merchant-customer relationship where users easily lose interest. Once you’ve developed trust amongst your following, you can run a conversion campaign. The goal of a conversion campaign is to take your dedicated followers and turn them into customers. For this stage, try offering discounts or promoting sales, product trials, and events in your store. These tactics enable users to go from potential to actual customers. At this stage, it helps to create urgency since your followers have stuck around and engaged with your brand. Your followers understand the value of your product and have been educated through case studies, webinars, blog posts, etc. So now they’re ready to make a purchase decision. This is the stage of your campaign where you can run an offer. A well-placed offer ad is just the thing that can entice engaged followers to take the last step and buy. Specific targeting: When you target a specific audience, you give Facebook a strict set of parameters to work within to find the best targets. Parameters can be adjusted based on demographics for certain audiences. With specific targeting, the audience is generally smaller but more relevant to your needs. 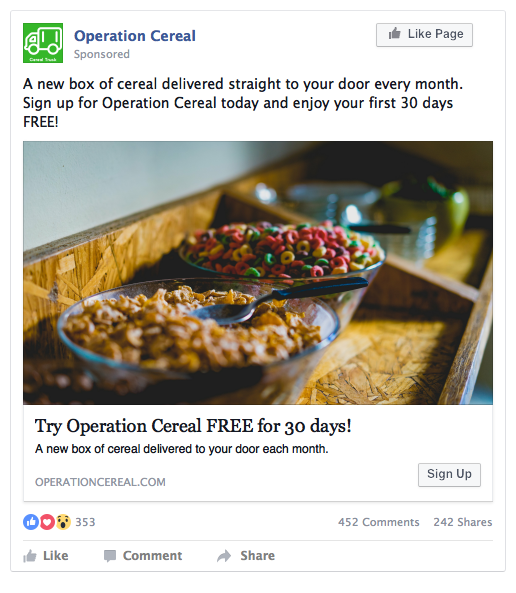 Broad targeting: When you target broad audiences, you’re relying on Facebook’s delivery system to find the best users to show the ad to. This approach leads to a diverse range of followers and is best when you’re not sure which demographic to target. You can also run a narrower campaign afterward. Once you’ve had a chance to check out the audience insights and ads reporting, you can identify who reacts positively to your ad sets and serve them ads. A custom audience is a group of Facebook users that you’ve decided to target for a particular ad campaign. Facebook has a number of different options for customizing audiences that you can choose from. Customer List: This is a standard custom audience that you can create by uploading a list of your subscribers, followers, or customers to Facebook and asking Facebook to find the users. Generally, Facebook will find 60-80% of the contacts on your list. Most email marketing platforms also have audience sync tools for greater accuracy. Website Custom Audiences: With this option, Facebook matches people who visit your website with users on Facebook using a pixel. These can be made from any set of actions that your Facebook pixel has measured - for example, you could create a campaign targeting users who visited a particular product page, but never purchased the product. App Activity Custom Audiences: This type of audience is similar to a web activity audience, only it concerns activity in your mobile app. This sort of audience is useful if you’d like to reach users of your app on Facebook. Engagement Custom Audiences: Engagement is different from other audiences in that it find users based on their actions on Facebook, rather than on your website or app. This is a list of users who have engaged with your content across all of Facebook’s platforms and services (including Instagram). This lets you target users who took a specific set of actions or engaged with a particular piece of content. You can target all of the users that engaged with a particular ad or media - such as a video, lead ad, canvas ad, Facebook page posts, Instagram business profiles or a Facebook event. Lookalike Audience: These are new users that are more likely to purchase from your company based on their behavioral similarities to your existing customer list. When you create a Lookalike audience, you’ll be asked to determine the size. Smaller audience size will more closely resemble your source audience, but larger audiences will have a wider reach. Facebook recommends a source audience of 1,000 to 50,000 people. Your source quality matters, so you’ll want to limit your source audience to your best customers. Daily Budget: Facebook will attempt to get you a day’s budget worth of results. Some days, more will be spent if high-potential opportunities are available. Other days, less will be spent. The daily budget is not a strict daily spending limit, rather it’s an average daily amount that’s spent over the ad campaign period. For example, if your budget is set at $10 - Facebook will spend $12 some days and $8 on others. The idea is to average out the daily spending amount at the budget. Lifetime Budget: With Lifetime budgets, Facebook will take the total campaign budget and try to spend it evenly across the campaign timeline. Again, this number can vary slightly day to day, depending on the opportunities of that day. You cannot change an ad set’s budget type after you’ve selected it, so make sure that you select the right option. If it’s your first foray into Facebook advertising, we recommend setting a daily budget and using an unlimited campaign duration. This will allow you to adjust the budget day-to-day if you want, and also stop the campaign any time you wish. Once you’ve set your campaign’s budget, you’ll then select the Ad Delivery Optimization method. Ad Delivery Optimization is the end-goal you’re most interested in and allows Facebook to optimize your campaign in order to meet this goal. If this is your first foray into Facebook ads, we recommend using automatic bidding. Manual bidding is useful to get more clicks for less, but before you can value a click, you’ll want to know what the average bid is and the average cost-per-result for your ad. Manual bidding can be used once you have a good idea of how much a click is worth to you. Facebook also provides you with a range of suggested bids. Facebook’s pre-existing manual bids tend to be high, so make sure to always adjust the suggested. For example, if Facebook suggests a bid of $1 per link click and the bid range is $0.40 to $0.80 - it’s best to bid somewhere between $0.40 and $0.60. 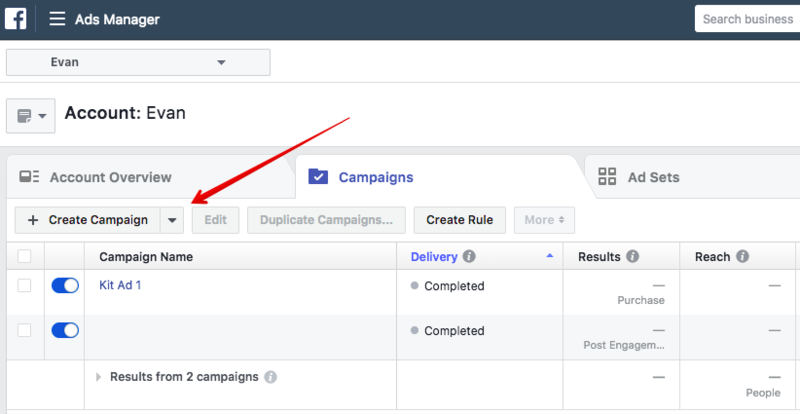 Facebook also allows you to manage your ads delivery schedule so that you can customize when your ads run and how Facebook should deliver them. For example, if you’re looking to create an ad that runs at a specific time you can create the ad set in advance and turn off the ad set right away. You can turn the ad set on when you’re ready to start running the ad. You can also set a start and end time for an ad set if you’d prefer. Standard Delivery Option: Facebook will try to spend your budget evenly through the course of your campaign. Accelerated Delivery Option: Facebook will how your ads and spend your budgets as quickly as possible throughout your campaign. For most ad sets standard delivery is fine. However, if you have a big budget and a time-sensitive promotion, you might consider accelerating your pace. Setting your objective to reach, then your ad will appear to as many users as possible. Cost per click is lower when you set link clicks as your objective, so if your goal is traffic, optimize for clicks. From this screen, you’ll set the campaign goal. Remember to choose a goal that works with your business. If you have less likes consider an awareness campaign. If you’ve built a solid following, try conversion. After you select the type of campaign you want to run, you’ll be prompted to create an audience or use a saved audience. This is where you can specify which users you want to target based on location, gender, age, interests and behaviours. The key here is to understand what groups your audience is likely to be included in. If this is your first ad campaign, be broad with your audience. You can be more specific when you have a better understanding of their interests and behaviour. Select the format for your Facebook ad. Remember to use the format that best represents where your business is currently and what your goals are for the campaign. Add your images. This step is important. Not only does the average Facebook user sees a ton of ads a day - but they’re competing for attention with the user’s news feed, friend pics, and status updates. You want to capture the user’s attention right away. This is a step where it helps to be bold. Brighter colours stand out more on Facebook than muted colours. If you’re using your own pictures - make sure you’ve hired a professional photographer. If you can’t hire a professional photographer - sub in some visually-stunning free stock photos. View the results of your ad campaigns at an account level in the Account Overview section. Customize the date range you want to view data from and also select from a number of metrics to view data - such as reach, impressions, amount spent and link clicks. Use the overview section to determine which products perform better at certain times of the year and adjust your ad strategy accordingly. See who engages with your Facebook ads and who doesn’t. Over time - this will allow you to either broaden or target a more specific audience, based on what conditions are more likely to get users to click. See how many conversions occurred as a result of your ad and measure the success of the ad. Look at cross-device reporting, which lets you see how users move between devices to make conversions - for example, if they download a mobile app from an ad on their desktop. Actions: used as a metric for measuring engagement. An action is any activity that happens in your ad. Facebook pixel. The Facebook pixel is a snippet of code that you can add to your website that feeds information to Facebook. Used in tandem with the custom audience feature - Facebook’s pixel is able to deliver ads to users that are more likely to convert based on what information the pixel has gathered about their behaviour. Facebook calls this conversion optimization. The more users who click the better Facebook becomes at determining how likely a user is to take action on the ad. To understand what metrics you should be keeping your eye out for you want to refer back to the goals you set out when you started your campaign. For example, if your goal was brand exposure and you ran a video ad, the metric you might be most focused on is the cost per 3-second video view metric because it would be a good measure for the exposure of your ad. If you ran a conversion campaign, then your attention would be more focused on the cost per app install or cost per conversion. Comparing the performance of your most and least successful campaigns over a set period will help you understand which audiences, placements and schedules are the most effective for your brand. Keep in mind that you want to compare ads with similar audiences, budgets, optimizations and campaign lengths to get a good sense of performance. 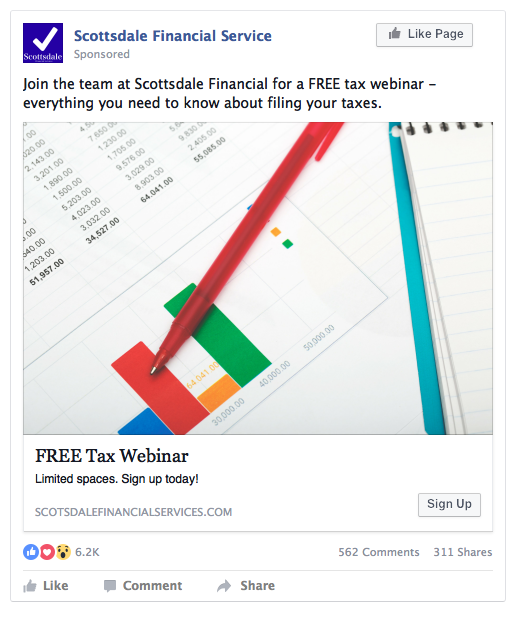 Targeted Facebook ads are a budget-friendly way for small business to reach big audiences, but that doesn't mean they’re easy. Success in a Facebook ad campaign will be dependent on your ability to analyze data gathered from your previous ads and use what you’ve learned to dictate your next ad. There’s a lot of trial and error involved with understanding Facebook ads. Don’t get discouraged if a campaign doesn’t go as well as you’d hoped. \Instead of thinking of the ads dichotomically as being a success or failure - think of each campaign as a stepping stone to gaining a better understanding of your audience. If your ad campaign isn't a complete success, take a look at your metrics, see what works and what doesn’t and use that information to make your next campaign better. Burst has thousands of hi-res, royalty-free images ready for your social media marketing campaign.